My Forever Treasures, celebrates Black History Month every day of the year. We offer museum quality black memorabilia, for the most classic collector. Our items are rare, special, and come with “A put a smile on your face guarantee.” Autographed photos of Paul Robeson, Lena Horne and James Brown. Jackie Wilson autograph + fan club card. An Aretha Franklin autographed album cover. = to entice you. 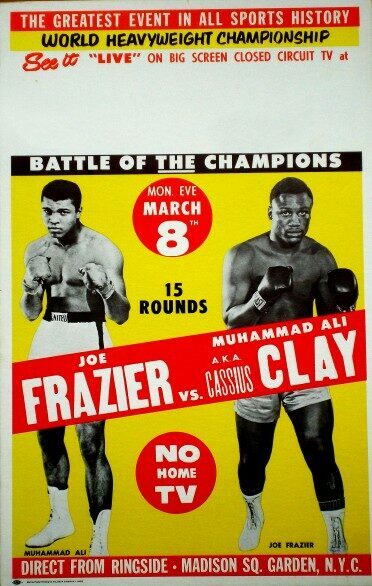 Muhammad Ali aka Cassius Clay and Joe Frazier dual signed 1971 “Fight of the Century” Poster. 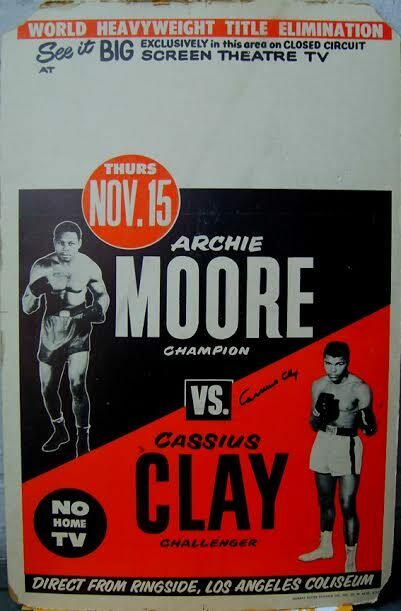 From our vault, a 1962 Cassius Clay vs. Archie Moore Boxing Poster, autographed by Cassius Clay. Jay-Z, couldn’t find a nicer one. A Club Harlem, Atlantic City, All Sepia Floor Show Ashtray. This was the crown jewel of black superstar entertainment in the 1950’s and 1960’s Ray Charles, Aretha, Duke Ellington, & Ella Fitzgerald graced their stage. Oprah would agree. This is world class vintage “eye candy.” This is blog 1, of several Black History Year Treasure Updates. Images of most items are on the site and blog pages. We look forward to making your vintage dreams come true. Beyonce has us on speed dial. 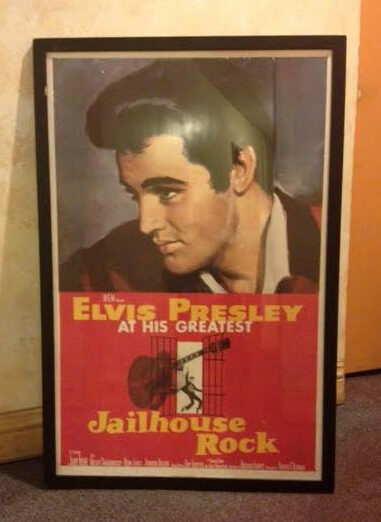 “Jailhouse Rock” was Elvis Presley’s third film. Elvis played a released ex. con, who had served time, for an unfortunate manslaughter charge. 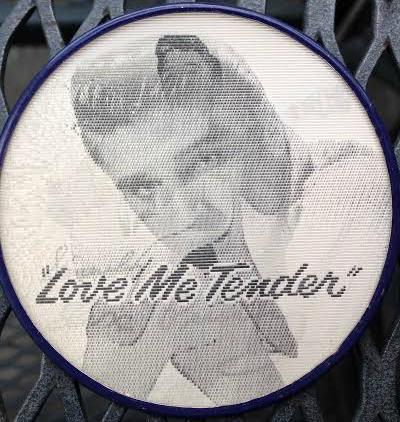 A familiar Presley premise, offered him aspiring, to be a successful singer. He would overcome obstacles and fall in love, before the final credits read, “The End.” A great # 1 song “Jailhouse Rock,” had Elvis singing the song, in a great dance number, he choreographed himself. Many consider, the “Jailhouse Rock” dance number, Elvis Presley’s greatest screen moments, of his entire film career. 22″ x 28″ # 57 /533 lithograph poster M.G.M. 1957. 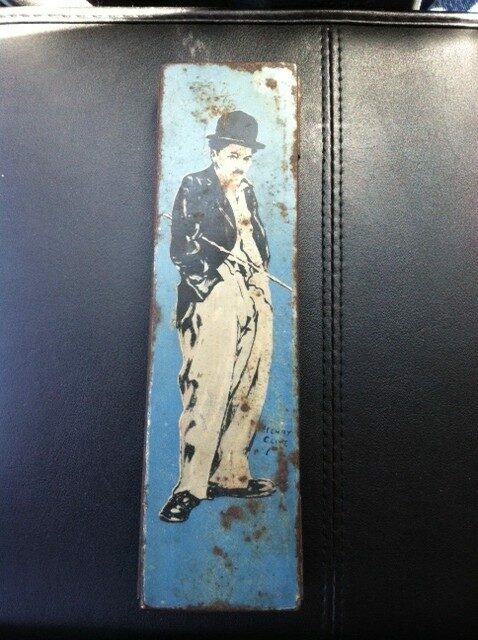 Vintage 1920, Charlie Chaplin Tin Pencil Case. “Tramp” artwork by Henry Clive. 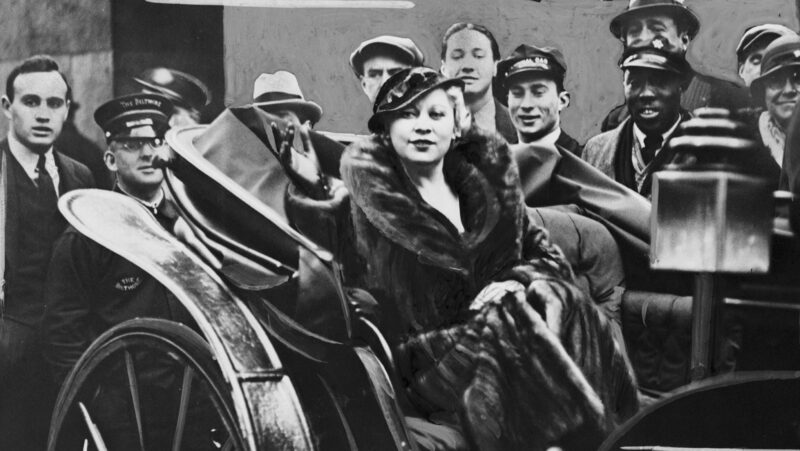 Clive was among the most in demand, for his museum quality pastels of Ziegfield Follies, flappers and film stars like Chaplin, Pickford and Pola Negri. His artwork was featured on pencil cases, cosmetic tins and screen magazines into the 1950’s. From 1920, Henry Clive became Charlie Chaplin’s Art Director, for all his films. Henry played a villain, in Chaplin’s “City Lights.” All his rare original artwork, is highly sought, as he was a master of pastels… The artwork of the “Tramp” on this pencil case, marks the beginning of a long successful collaboration for these two very talented artists. This silent film treasure, is a Beutebox Canco Product. 8″ x 2.5″ Pamper yourself. You deserve the best. $2,500 + shipping. In Dec. 1956, the premiere of the film “Don’t Knock The Rock” took place. This was the follow-up to the very successful, Bill Halley and the Comets film “Rock Around the Clock. ” A disc jockey in this 1956 music film, presents a rock concert. He wants to show parents, rock and roll music, won’t turn their children into juvenile delinquents. Haley and the Comets, and other hit makers are part of the stage show. 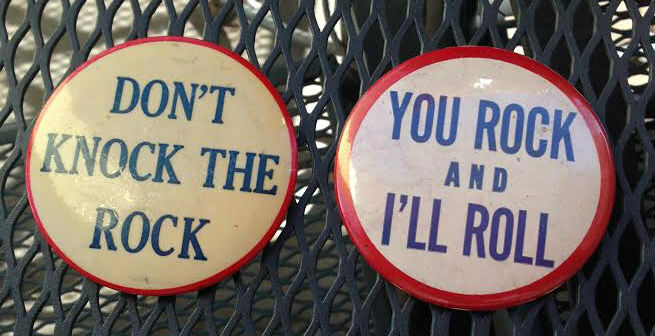 “Don’t Knock The Rock” is highlighted by Little Richard’s debut performance of “Tutti Fruitti” and “Long Tall Sally.” Promotional Pinback, “Don’t Knock the Rock” is taken from the film title. “You Rock and I’ll Roll” is a phrase heard from fans of the music. Both are large 3.5.” and extremely rare, especially early rock and roll treasures. For the collector of vintage, museum quality rock memorabilia. Bill Gates has us on speed dial. $2,500 each, + shipping. 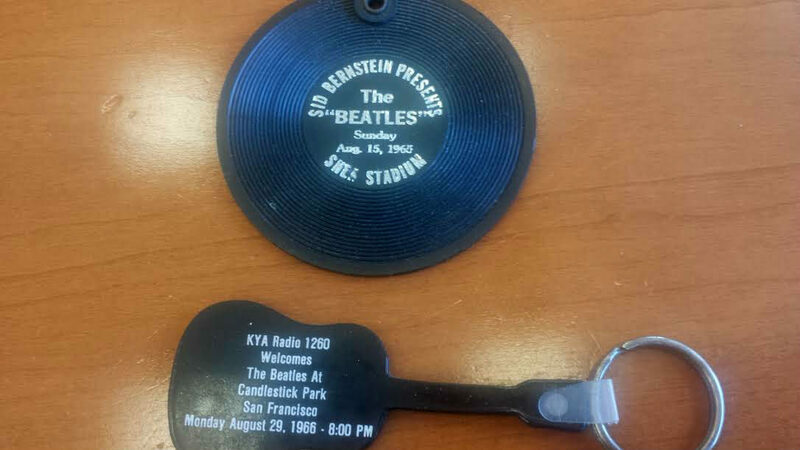 These 2 pinbacks belong in a rock and roll museum, or a safety deposit box. Enjoy. Entering the ring, for this Nov. 15, 1962 bout, young Cassius Clay was 15-0. Archie Moore, a former light heavyweight champion, was boxing before Cassius was born. The ultimate showman, Clay brought attention to Moore’s advanced age, by having a 63 year old sparring partner. The public loved, his brash fight predictions. This bout offered one of Clay’s best. Cassius predicted, “I’ll say it now. And I’ve said it before. Archie Moore, will go down in Four.” He did. As the future 3 time heavyweight champion’s record would now be 16-0. Cassius Clay left the ring, declaring, “I am the greatest, of all time ! !” 16-0, gave him a perfect beginning. Direct from the Los Angeles Coliseum. 14″ x 22″. This poster was signed by Cassius Clay. On his Facebook page, Ali says, this signed poster is “Priceless.” A museum quality treasure of the ages. This March 8, 1971, fight was the first between Muhammad Ali and Joe Frazier. It will be forever called “The Fight of the Century.” Both boxers entered the ring undefeated. 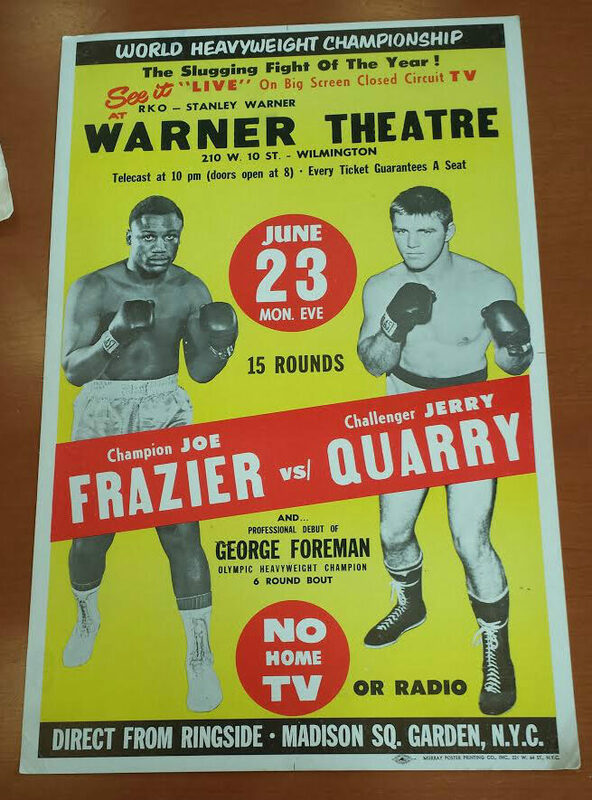 To give them equal billing, Ali’s picture is first and Frazier’s name is first as well. The poster reads Muhammad Ali a.k.a. Cassius Clay in larger print, because this was early use of his new name. It marked, the last time, the name Cassius Clay would appear on a poster. Ali was stripped of the Heavyweight Title, when his new Muslim religion had him not enrolling in the armed forces. Less than a year after this Frazier fight, the Supreme Court overturned the decision that had taken Ali’s Heavyweight Title. Frazier would win this fight. Ali would win their next two epic battles. “MUHAMMAD ALI A.K.A. CASSIUS CLAY” VS. JOE FRAZIER MARCH 8,1971. DIRECT FROM MADISON SQU/ GARDEN N.Y. BIG SCREEN CLOSED CIRCUIT. 14″ X 22″ MURRAY POSTER PRINTING CO. N.Y. UNSIGNED $450 Muhammad Ali is Lighting Fast!